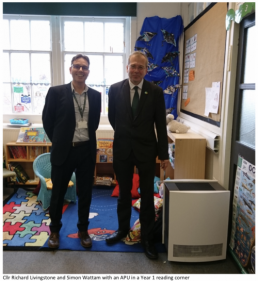 We are delighted to have helped Goose Green School in East Dulwich raise funds to install Air Purification Units in its classrooms to protect pupils from air pollution. In July 2016 the Mayor of London identified hundreds of schools across the capital in locations exceeding legal air pollution limits. London air pollution levels have been of increasing concern with over 9,000 Londoners dying each year due to long-term exposure to air pollution. Whilst Goose Green School was not amongst the Mayor’s top 100 most polluted schools identified in the report, staff and parents have been keen to act to mitigate the effects of London’s dirty air on its pupils. In February 2018, following a hugely successful fundraising drive, the Friends of Goose Green School (“FOGGS”) installed an 80m long “green screen” of pre-grown ivy between the school’s playground and its neighbouring road. The success of the Green Screen Project inspired the school, together with its pupils and parents, to carry out a number of different air quality initiatives in a bid to lead the way for other London schools to truly improve air quality in and around schools. 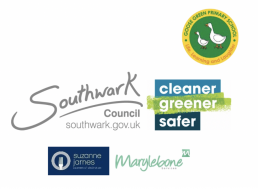 The school successfully secured a substantial grant from Southwark Council’s 2017 Cleaner Greener Safer programme as well as an additional grant from Marylebone Services for the immediate improvement of the school’s internal air quality. The school’s Parent Teacher Association, FOGGS, also contributed to the cause after running a supper club in conjunction with Suzanne James, a local catering company. This money has been used to purchase Air Purification Units (“APUs”) for every classroom in the school, including its nursery provision. Indoor air quality is often overlooked but the truth is the air we breathe indoors can be up to 5 times worse than outdoor air and polls have shown that three quarters of British children spend less than 60 minutes outdoors each day. Indoor air quality can be worse because outdoor pollution (mostly NO2, PM and ozone) gets inside and adds to the pollution we generate indoors. Indoor pollutants include volatile organic compounds (VOCs), carbon monoxide, formaldehyde, asbestos, PM, mould, dust mites, and NO2 from cooking. APUs are freestanding mechanical units which have been proven to clean internal air, not only from road emissions and other pollutants (including NO2 and PM2.5) but also allergens and viruses. They will therefore serve a dual purpose: providing the long-term health benefits of reduced lung damage from pollutants and the shorter-term benefits of fewer sick children and higher attendance and productivity rates. Such units have even become a legal requirement in schools in some of the polluted cities around the world. 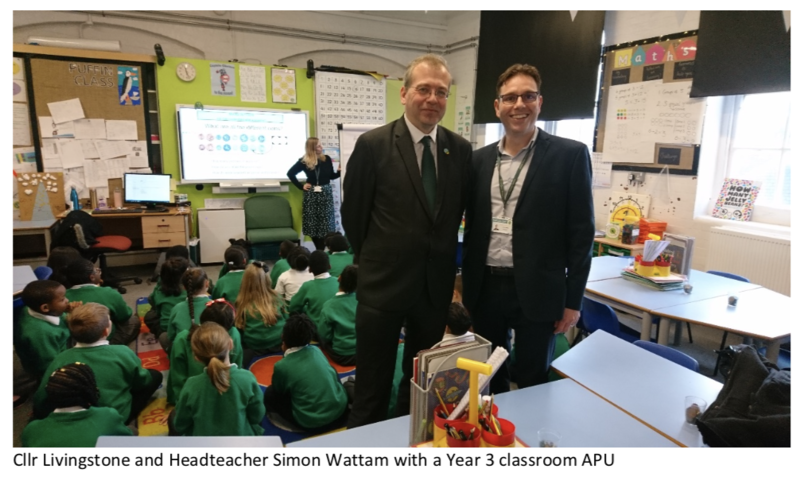 The same APUs, manufactured by Swedish company Blueair, were installed earlier this year in another primary school in North London with impressive results – the air quality improved with up to 88% of pollutants removed. 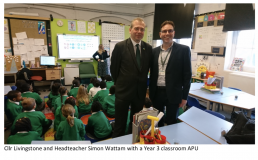 Goose Green School’s APUs were installed in early November 2018, much to the delight of the pupils, whose awareness and enthusiasm grows more with every step the school takes to improve the school’s air quality. Simon Wattam, Headteacher at Goose Green said “We want to focus on pupil and community engagement and behavioural change as well as the necessary “sticking plaster” mitigation measures. That is why we are also engaging with the Council to discuss School Streets and helping parents and children choose active travel as well as implementing measures such as the Green Screen and classroom APUs”. “You have had an enormous impact which will help your health … but also you’re having a much bigger impact in our little area of South London in showing the way and showing how we can make a difference”. Goose Green School intends to continue to lead the way, having been the first school in London to install both a green screen and classroom APUs. Working with Southwark Council and with the support of British Recycled Plastic (who have kindly donated the planters), the school is currently in the process of installing its pioneering “Smog Shields”, 8m of exhaust- height clean air planting along the traffic barriers at the school entrance, to protect the children from spikes of pollution at pick-up and drop-off times. Other ongoing initiatives include liaising with Southwark Council about implementing a School Street to reduce traffic at the school entrance at peak times, implementing a “walking bus” and “park and stride” scheme and further adding to the school’s clean air gardening within the playground. Goose Green School continues to act as a green beacon in Southwark by regularly attending the council’s Southwark Schools Air Quality Network and by sharing its experience and knowledge with other schools and community groups.